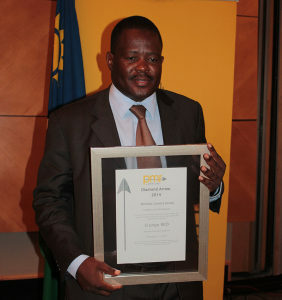 Erongo RED scooped PMR Diamond Arrow Awards in Electrical Contractor Supplier category at the PMR Africa Awards ceremony held in Windhoek on 16 February 2015. These awards are given to companies and institutions that are performing in their sector to stimulate the economic growth and development in the country. According to the Chief Executive Officer of PMR Africa, Johan Hattingh, the purpose of the PMR Africa award is to profile Namibia as a growth point and potential investment area for foreign and local developers and investors. “The PMR Africa Awards aims to measure companies, institutions, government entities and individuals on their contributions to the economic growth and development, levels of managerial expertise, implementation and corporate governance” said Hattingh. Erongo RED would like to take this opportunity to thank all the respondents who nominated and rated the company. Erongo RED would also like to thank it’s employees for contributing in different ways in making Erongo RED the trendsetter and a leader in the Electrical Distribution Industry.